When it’s your child’s birthday, you want them to know how loved they are. You want them to feel special. But as a minimalist, you don’t want to go overboard or place the focus on stuff. How do you avoid the onslaught of gifts and excess that often comes with a celebration? There are many ways to celebrate and make your child feel special on their birthday that doesn’t involve a huge party with over-the-top entertainment, decorations, “goodie” bags for guests, piles of gifts, or one-upping the previous party your child attended. You can make your child feel special in simple ways and that can include your child getting to celebrate with their peers. Minimalism means more time for the things that count, like those celebrations. Most of us, at some point, will allow our kids to have a party with some of their friends. 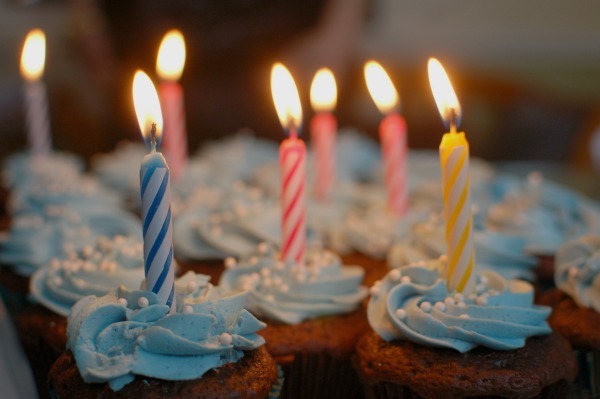 Personally, we do “friend” parties on milestone birthdays-at ages 5, 10, and 15. The party is scheduled and kids are invited. Your goal is to keep it simple, but then panic sets in as the party gets closer. How will you keep the kids occupied? What are people going to think about not bringing a gift? What if they bring gifts anyway? Will you get rid of them soon after? And what will they think if you do? You have to give the kids something to take home. Don’t you? You hop on Google looking for a simple menu, games, and answers to the questions swirling in your mind, and end up on Pinterest, overloaded with 1000 so-called “simple” ideas for the “perfect” kid’s party. Before you know it, you’re buying a store-bought cake, throwing together “goodie” bags full of plastic junk because it’s the “quickest” option, and inviting extra friends because someone was surely left out. Spending excess money to boot, just to be done with it all. With a little planning and changes to your thought process, you can stop the downward spiral. Let go of all the “shoulds,” “have-tos,” “but what about …,” and any lingering guilt. Decide what’s going to work for your family and your child, and then do it! We’ve decided what works for us, and that’s what we do. There’s no rule that you have to bring birthday treats to school, have your child’s entire class to a party at the local “Fun Place” whatever it may be, or invite all of your family to your home, including third cousins twice-removed. While all of those things are fun for some, if it’s causing you stress, recognize that none of it is required! There is no “right” way to celebrate. If you’re stressed out, then the birthday boy or girl will be stressed out. Then no one is having any birthday fun! Put a group of kids in a room with a few boxes, and they will find a way to have a good time. It’s the adults that seem to have trouble overthinking and over-complicating things. Cupcakes, a few friends in the backyard, and a silly homemade game or two-that’s all we needed for a celebration when we were young, and it’s still true today. Unless you love it (which some people do, I get that! ), skip the Pinterest party planning and go for classic, practical simplicity instead. Thinking “classic” will save you time, stress, and money, and keep your child’s next birthday party super-simple. 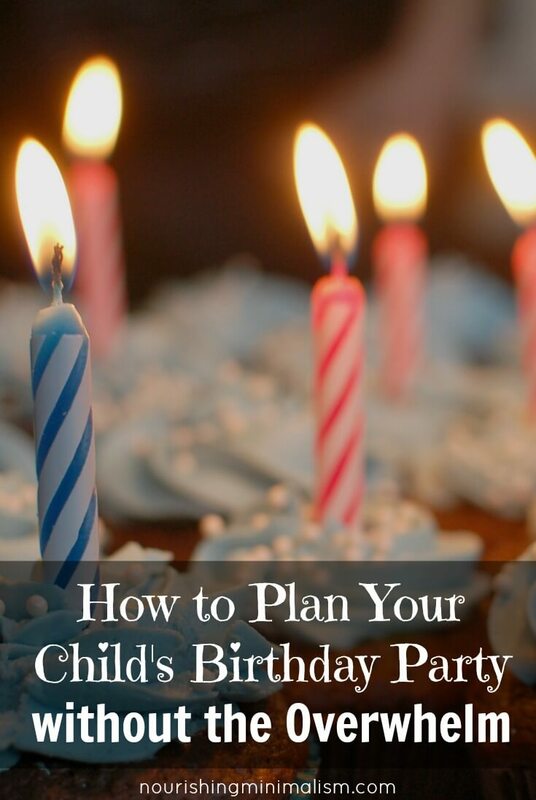 There are several things you need to consider when planning your child’s birthday party, and less is more in each one of these areas. Invitations: Inviting can be as simple as a text or a phone call. Fun-time: Plan a classic game or activity. One or two is plenty! Egg-on-a-Spoon Relay Race (Hard-boiled, of course), or any relay race! But don’t take too much time thinking about it. Give your child a few age-appropriate options, and let them choose. Food/drinks: Don’t feel like you need to serve a meal! Kids are so busy having fun that they often don’t eat much at all. Having a cake and punch is plenty. If you want to provide anything else, keep it simple. Gifts: Entirely up to you! Make your preference known, and be prepared to graciously accept gifts because some people will bring a gift anyway. An easy way to share gift preferences is with CakeClub so you can simply share a link with friends and family without feeling like you are controlling or insensitive. If you want to give something for guests to take home, bubbles make an inexpensive, fun, and consumable, party-favor. Check in to see what your child’s birthday preferences are. Some kids prefer a special activity with a friend or two like bowling, going to the movies, or swimming, instead of a party. If your child’s birthday falls in a warmer season, consider having the party at the park. No need to plan games or activities; they will have a blast just playing on the equipment, and no mess left for you to clean up after! We decided to do the park for the 4th bd. Cupcakes, juice boxes! We bring a trash bag! Simple as it can get! I didn’t even know what gift bags were until my girls were 2 & 4! One of the worst things ever invented, in my opinion!! love the park idea 😊😊 dont know why it never occured to me before, seeing that my dd’s birthday is in June 😁 saying that, we also keep our parties super simple. we are lucky in that my kids friends parents, although not minimalists, are into simple living. We usually do a garden party with a few close friends (we homeschool so no inviting an entire school class!) with easy food like homemade pizza slices/hot dogs with buns or pancakes with jam (all on paper plates!) a couple of party games like the ones you mentioned, and one cake (birthday child chooses flavour), plus some sweets at the end. The kids are outdoors the whole time unless its heavy rain and we keep the parties to 2-3 hours max. sometimes the parents will come too and help out. i am so glad we can keep it simple without the kids expecting too much! I will definately consider the park idea next year (my dd’s birthday is in a few days and is already planned – yep, garden party!) great article! The last two years, for my daughter’s birthday(she’s getting ready to turn 9 next month), we have done a party at the house. It’s really simple–cake or cupcakes, some fruit, and maybe crackers or chips. She plans and leads her own games because she is creative and a leader by nature. The daughter of a friend of mine has recently decided to donate her birthday gifts to charity and states that on the invite. She picks a different charity every year, depending on what is happening or on her heart that year. We also generally have “birthday” themed parties: a few balloons, streamers, and lately, we let the kids pick some paper plates with characters on them. I do bigger parties than you (I mean, I only have two kids), but it’s still cut down from the “whole class” model. We just hang in our house/yard and play a few crazy games. The biggest winner is letting small boys have a pool noodle battle. For several years now we put on the invitation that gifts are not necessary and any gifts given will be be donated to the Children’s Hospital. I also don’t feel guilty about not giving out goodie bags since they are not bringing gifts. Another idea for party ideas is making a craft or 2. That has worked well with my daughter and her friends. Love this! It’s very much the approach I take to kids parties. The party is for the kids after all! They just want cake and some fun times with their friends. We just had my 5y old’s party. She was prepped in advance for no presents and instead chose donations to the school library in lieu of gifts (other choice beginning a charity for disadvantaged families in Australia). Instead of party bags – kids get a home baked smartie cookie. For invitations – always use paperless post. This is the second year we have had my son’s party at the park, which also has a beach and a splash pad. It was great! I always believed in simplicity and love. Lived on a beautiful Lake in upstate NY. At that time it was a summer lake, after Labor Day you could drive around the 7 miles and maybe see only 2 cars pass you. We lived in an area with 5 year round homes fronting the lake. Three of us had young children the sames ages. Birthday were simply beautiful. Each mom brought their child’s favorite sandwich, and a dish to share with other moms. Yes we had cake, but it was simple, home made and low on sugar. Strawberry shortcake was a big hit with all the kids because we lived a mile from a pick your own strawberries farm and we surely did and always had them in freezer for special desserts. Gifts were “gently used toy” we all had toys our children for one reason or another just did not take too. We put them up on a shelf and we allowed our child to pick one for their friend for each party. One thing we had were balloons. I love them, still today in retirement! The ones we all blew up and tied ourselves. My heart loved living there. My husband was transferred to Fort Lauderdale, FL 8 years later and as a result I look back on these early years with my family on a small lake as the best life there is. So blessed to see mom’s getting back to what is truly important and discarding the rest. Thank you!